Looking for something truly unique and romantic to give someone (or yourself) for Valentine’s Day? How about a tempting plunge into one of 12 tantalizing Arnie’s Ice Cream flavors? 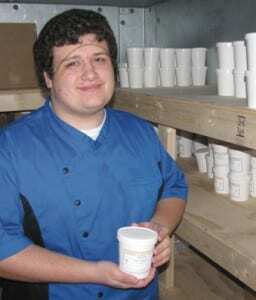 Arnie’s Ice Cream is the creative sensation of 19-year old entrepreneur Brandon Darmstatd of Montpelier. “I started working on this project in 2013 and wow did I find it wasn’t easy to make it happen,” explains the 2015 U-32 graduate. But with the guidance and support of his parents Chip and Alisia, and even younger brothers Sam and Charlie (“they eat too much of the ice cream”), Brandon got all the permits and licenses for manufacturing and selling his own ice cream. He then rolled his custom-made cart out into the downtown Montpelier summer scene on Aug. 21 with six flavors. “Finally all the little pieces aligned perfectly and we did well and got a ton of returning customers,” reports Darmstatd, who was also working on more fabulous flavors at his manufacturing plant on 46 Gallison Hill Rd. in Montpelier. As planned, when Darmstatd closed down the cart business after Columbus Day, he started “phase two” of his business plan and began to wholesale to local stores and restaurants such as The Uncommon Market on Elm St., Red Hen Bakery in Middlesex, the Adamant Coop, the Plainfield Coop, Sarducci’s, and The Skinny Pancake in downtown Montpelier. Darmstatd admits he likes making and creating the different flavors of his ice cream more than selling it on the street. The help Brandon gets from family and one part time production assistant allows him more time to be focused and creative with his products. He is also hoping soon to unveil lots more flavors plus ice cream sandwiches, vegan varieties of ice cream, and even a non-dairy sorbet. Some of the amazing flavors beyond vanilla and chocolate are maple, coffee, spicy maple bacon, mint chocolate chip, vanilla chocolate chip, Aztec (spicy) chocolate, coffee caramel crunch and root beer. “I’m into ice cream all year long,” jokes Brandon. You can order online at ArniesIceCream.com and pick it up at the plant on the road to U-32 before the Civic Center. It’s open Tuesday and Thursday from 3-6 p.m. and Sundays 12-4 p.m. Pints are $5 and 1/2 gallons cost $12. You can also call 802-613-3128 or email brandon@arniesicecream.com for more information. In case you are wondering who “Arnie” is, that would be Brandon’s grandfather, who was the inspiration and spirit that guided this project. “It was the only name that everyone agreed was the perfect fit,” Brandon said.